Fort Lauderdale, FL – Gas prices inched their way upward during the past week, but many drivers may not notice much change in the price at the pump. According to the U.S. Energy Information Administration, the average price for a gallon of regular unleaded went up less than a penny per gallon, and the average U.S. gas price remains the same at about $2.85 per gallon. Prices were fairly flat in many regions. 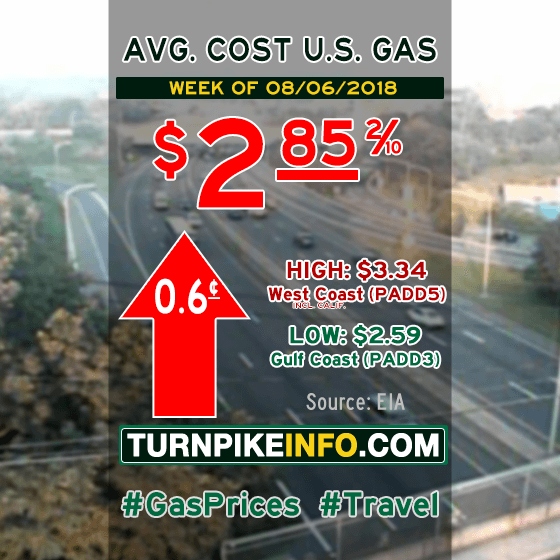 However, drivers on the East Coast and in the Rocky Mountains were hit with about a penny per gallon price hike, and drivers across the Lower Atlantic region paid about two cents extra at the pump this week, according to the E.I.A. Prices dipped by about a penny per gallon on the West Coast. The cost of diesel was primarily flat for truckers in most regions, although the E.I.A. reported that prices fell marginally in nearly every region. The price movement was hardly enough to change the national average cost of a gallon of diesel, which remains about $3.23. This week’s average fuel prices for all regions are shown below, as gathered from www.eia.gov.